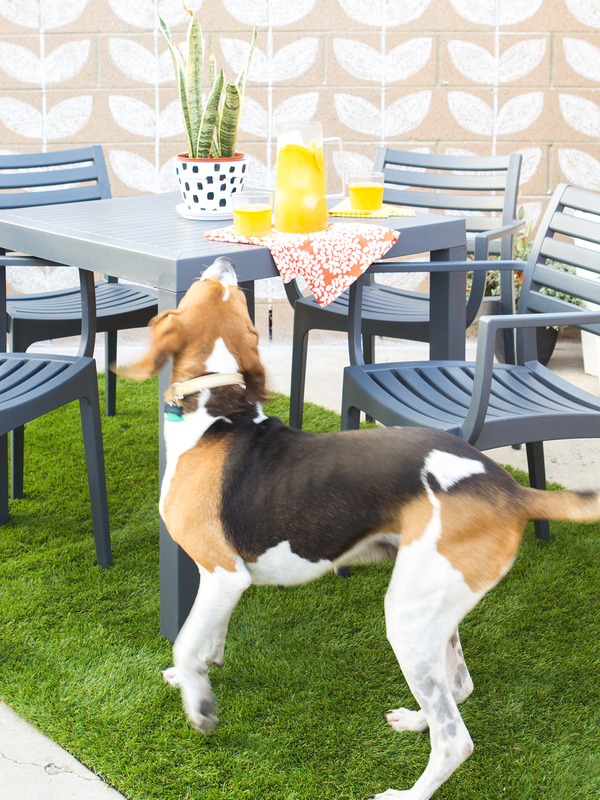 I’m taking a break from all things Christmas today to share a peek at our patio space! I know, I know, those of you bundled up in scarves and jackets might not want to see photos of sunny Los Angeles, but I have to admit the weather has been pretty great here. The always 70° weather is one of the big reasons we wanted to move here! Our backyard is much more of a concrete patio than a yard, as many yards are here in L.A. (you can get an idea of what it looked like when we moved in here). We really wanted to make this space feel cozy and welcoming because we plan on using it year around. 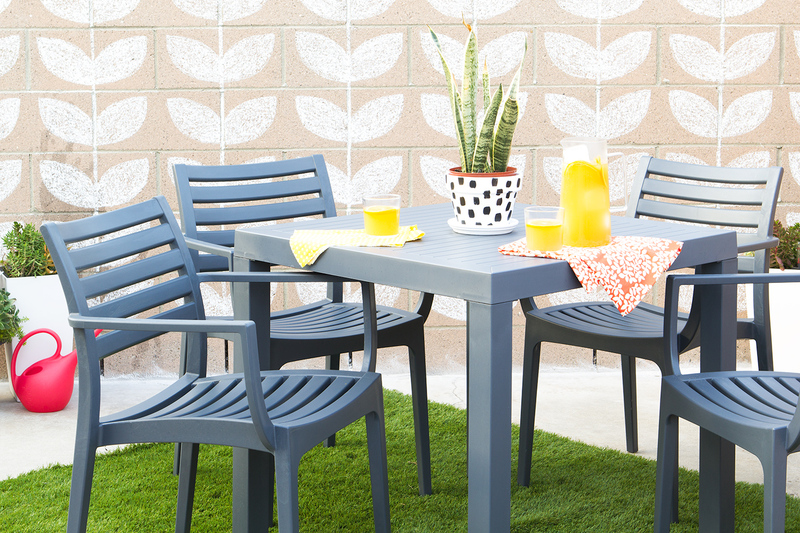 Since moving in, we’ve been on the search for a small patio set that was both modern and durable yet large enough to seat four people. 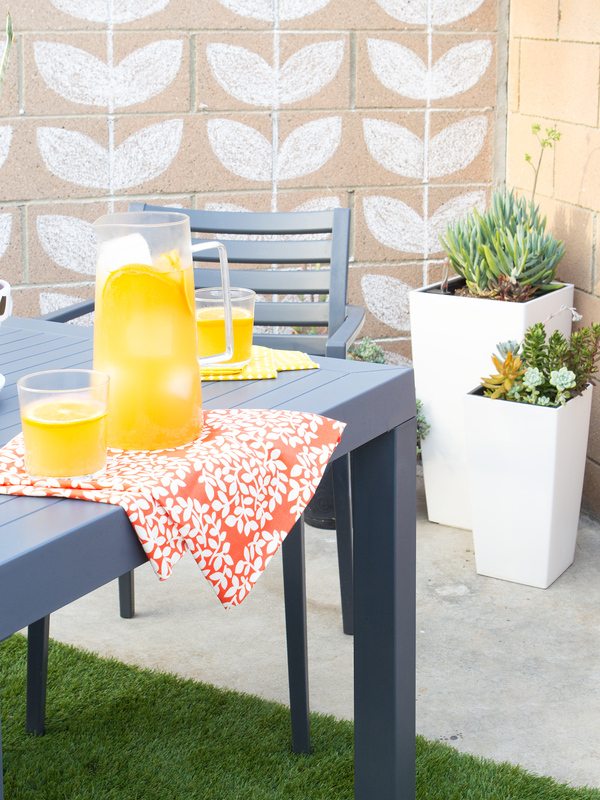 And that’s when I stumbled upon some great small space outdoor solutions on hayneedle! 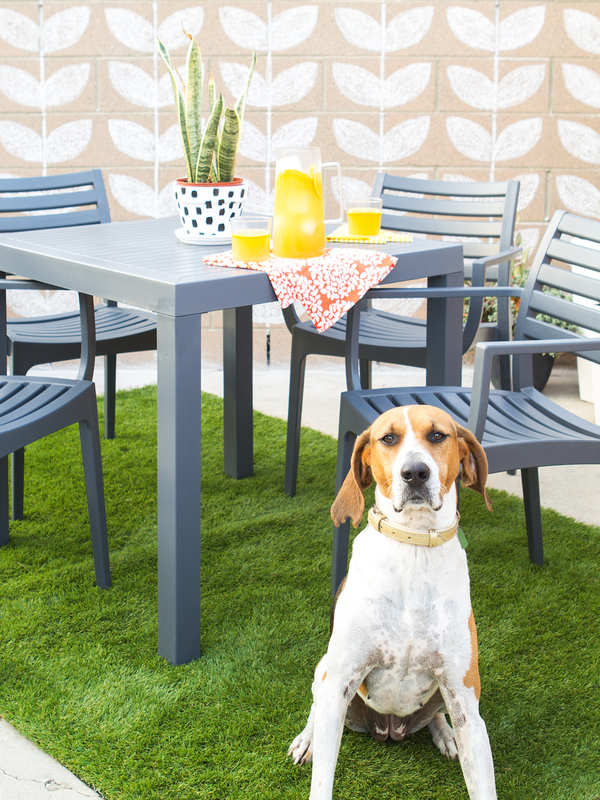 When I discovered this simple dark gray patio set I knew it was the one! It’s small enough to not overwhelm our tiny backyard but large enough to seat four people. Because let’s face it, though bistro sets are cute they aren’t very practical when you want to have a dinner party. It’s made of recyclable, weather-resistant polypropylene so it can stay outside without needing to be covered like sets with cushions would. And if dark gray isn’t your thing, it’s also available in other colors, including bright white. To add some greenery to the space, I filled these white resin planters with assorted succulents, which are drought-friendly and very California! The planters have a really cool self-watering feature so when the planters are a little more established, you simply fill up the reservoir on the bottom and it takes care of the rest. They can also be used indoors if you want to bring a little of the outdoors inside too. It’s true I don’t think I’ve met a pattern I didn’t like, so when my friend Rachel suggested I dress up the cinder block wall with some chalk, I knew it had to be with a pattern! I created a leaf template on a 12″ x 12″ piece of cardstock that I cut out with my Silhouette and got to work with lots of white chalk. I used the grout between cinder blocks as a guide for the stems and lined up a 24″ ruler to mark the vertical lines. Then I traced the template and filled in each leaf shape. I just love the way it looks! 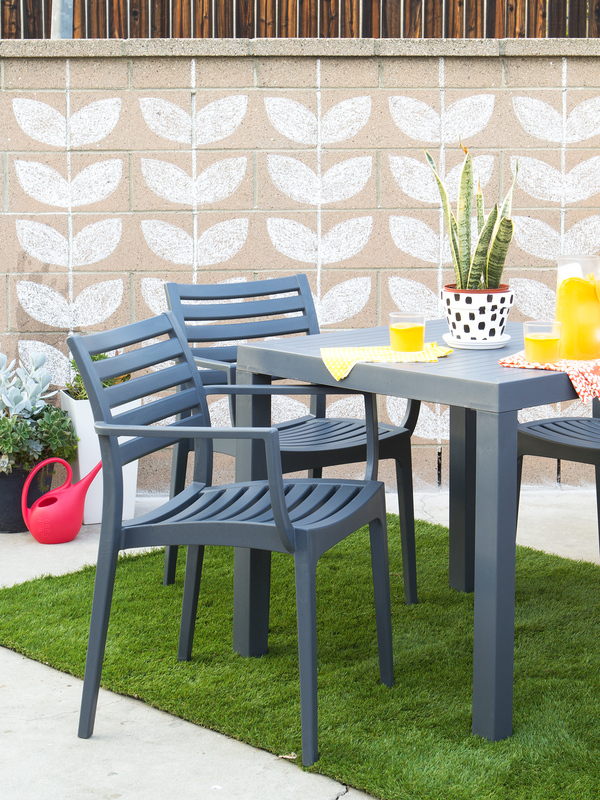 and create your own stem patio wall! Note: If you’re in a more damp environment, (hello sunshine state!) 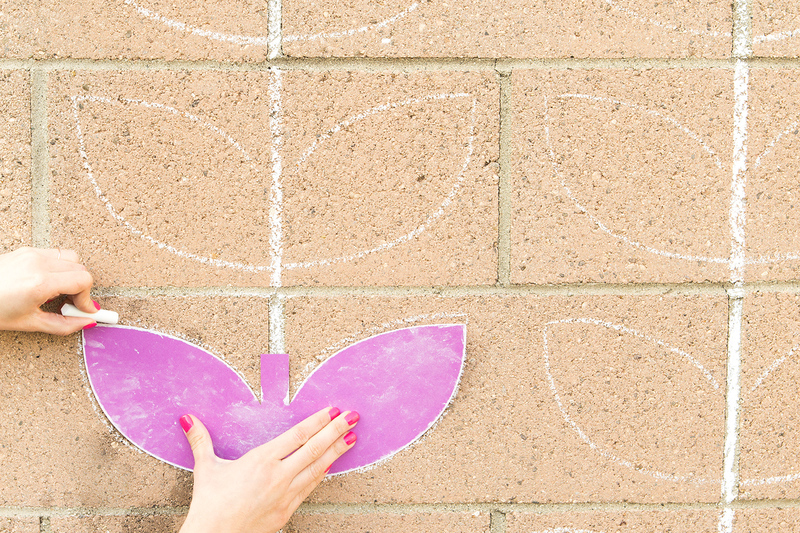 I’d recommend making a stencil and using chalk spray paint to create the pattern. I dressed up a plain terra cotta pot with a little bit of craft paint (you can watch my spotted pot video tutorial) and set a snake plant inside. And now between grilling, entertaining, and just relaxing in the sun, we’ve already used this space so much! I guess you can say we’re really embracing the indoor-outdoor living. And if feels more like a real winter where you are, you can always pin this post and reference it next season! When can I come over for a BBQ?! This turned out so adorably! Love the table set, too. Sarah, you killed it with that fun chalk wall. Brilliant! It is a wonderful idea for my little patio!!! i am definitely sharing this on my fb fan page!!! Thank you! And thanks for sharing it to your Facebook fans!